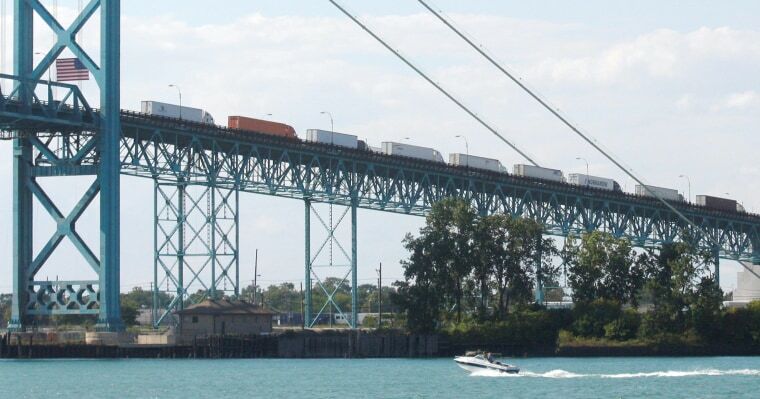 Every morning, as the sun rises over the Great Lakes, dozens of 18-wheelers queue up on both sides of the Ambassador Bridge connecting Detroit and Windsor, Ontario. Over the course of the day, hundreds more will pay their tolls, cross the 90-year-old span and clear Customs, the majority of them carrying automotive parts and accessories, as well as fully assembled vehicles. The scene repeats itself at a number of other locations, including the Blue Water Bridge linking Port Huron, Michigan, and Sarnia, Ontario. In fact, there is so much truck traffic that a third bridge is set to be erected on the south side of Detroit. Perhaps no industry has more deeply embraced the benefits of the North American Free Trade Agreement since it went into effect on Jan. 1, 1994. That helps explain why automakers and auto parts suppliers have become some of the fiercest and most vocal opponents of the Trump administration’s plan to renegotiate, and even demolish, NAFTA. As a candidate, Donald Trump turned American manufacturing jobs into a cornerstone of his campaign and early on attacked Ford over its plans to shift production of small passenger cars, such as the Focus, from the U.S. to Mexico. In office, he scuttled the trans-Pacific trade deal negotiated under President Barack Obama and ordered U.S. negotiators to go back to the bargaining table with their counterparts from Canada and Mexico. “We’re winning with NAFTA,” declared a newly formed coalition, Driving American Jobs, on its website. Comprised of automakers including General Motors, Toyota and Volkswagen, as well as the American International Automobile Dealers Association and the Motor & Equipment Manufacturers Association, the campaign has been emphasizing the benefits of NAFTA, aiming to counter the perception played up by the Trump administration that it is costing U.S. jobs. The trade agreement, it claims, generates $1.2 trillion in North American trade and is essential to the operation of the modern auto industry. Simply rebuilding a U.S. supplier base would be a daunting process, the industry claims, and by losing markets on both sides of the border, automakers fear many plants could wind up operating well under capacity. If they’re right, some estimates warn that new car prices might rise by hundreds, and in some cases thousands, of dollars. And instead of creating work, many good-paying auto jobs could be lost. Automakers aren’t the only ones trying to get that message across. “Cross-border trade supports over 46,000 U.S. trucking jobs, including 31,000 U.S. truck drivers, and generates $6.5 billion in revenue for our industry annually,” noted Bob Costello, chief economist for the American Trucking Association. “As the U.S. renegotiates this agreement with Canada and Mexico, we urge them to keep the tremendous benefits to our economy and our industry in mind,” he said. The NAFTA debate has created some strange bedfellows within the auto industry, however. While typically conservative auto and parts makers are pushing back against the Republican president, progressive and Democrat-leaning labor unions are generally supporting the administration’s efforts to renegotiate the agreement. That includes both the United Auto Workers and United Steel Workers in the U.S., as well as Unifor, Canada’s largest private sector union, which includes that country’s autoworkers. What drives many NAFTA opponents has been the rise of the Mexican auto industry. Once an industry backwater, that country is now one of the largest auto-producing countries in the world, in a league with the U.S., China, Germany, Japan and South Korea. Mexico produced 3.6 million fully assembled vehicles in 2016, about 50 percent more than Canada, though less than one-third the 12.2 million total in the U.S. But Mexican production has been rising fast with new and expanded plants operated by brands like Audi and Infiniti coming on line over the last year. And more are set to follow. Cheap labor is clearly a draw, especially for manufacturers like Nissan producing entry-level models such as its subcompact Versa, products whose profit margins are minimal. But there is also a growing number of high-line offerings, like the all-new Audi Q5, which will now be produced only in that new plant for worldwide export. Ironically, Mexico’s growth as an auto hub has as much to do with free trade as cheap labor. It has negotiated more open border agreements than any other country but Israel. Since candidate Trump began zinging automakers for their Mexican investments, several automakers have shifted gears. Ford, for one, scrubbed plans for a second plant in that country. But Executive Vice President Joe Hinrichs told NBC News that the decision was based purely on declining demand for sedans like the Focus. That model is now being consolidated into a plant in China, instead. Toyota this week confirmed reports it was scaling back a new factory it was building in Mexico. The investment was cut by 30 percent, to $700 million, and will now build only the maker’s compact Tacoma pickup. Toyota will consolidate production of the Corolla sedan in a new plant it is planning for the U.S. in partnership with Mazda. At this week’s Tokyo Motor Show, Toyota's Executive Vice President Didier Leroy told reporters, “We are not playing any political game, to please anybody — we are just doing what is the best for the company,” by opting for the most efficient cross-border network possible. GM is among those who have moved a handful of small parts operations back to the U.S. this year from Mexico. And Fiat Chrysler Automobiles Chief Executive Sergio Marchionne is among the first to openly reveal that his company is developing what-if plans should NAFTA collapse. That would include moving production of some pickup models back to the U.S. from Mexico. Those in the auto industry who would like to retain NAFTA as is, or at least as close as possible, do have some numbers to point to. Since emerging from the Great Recession, automakers and suppliers have been investing heavily in the U.S. This year alone that will come to about $9.5 billion in new assembly and parts plants, engineering facilities and other fixed assets. Whether the auto industry can convince the Trump administration to back down is far from certain. But, for now, as negotiators from the three nations of North America continue searching for a solution, the steady stream of trucks will continue to line up at Michigan’s numerous boundaries, as well as at bridges, tunnels and land crossings all along the U.S. border with Mexico and Canada.